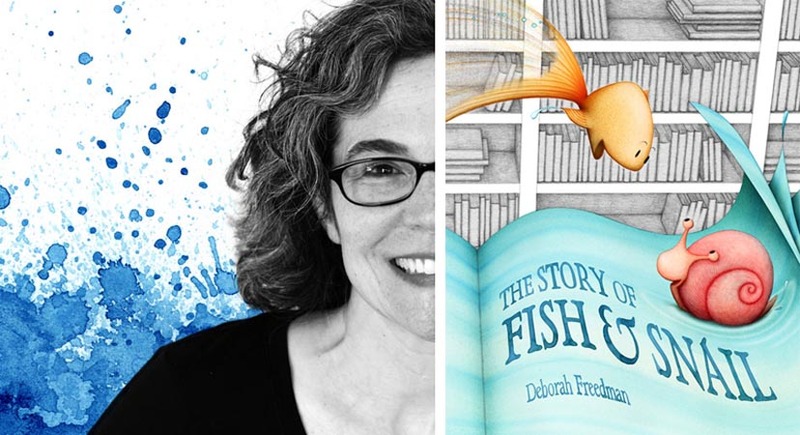 Deborah Freedman was an architect once, but now prefers building worlds in picture books. She is the author and illustrator of THE STORY OF FISH & SNAIL, BLUE CHICKEN, SCRIBBLE, and to-be-published (Viking, April 2015) BY MOUSE & FROG. Deborah lives in a colorful house in southern Connecticut, where she is busy at work on her next books. You can learn more about her at http://www.deborahfreedman.net. I write and illustrate picture books, and honestly believe that no one is too old to read picture books! Henry: So true! A well-written picture book like Where the Wild Things Are or Journey appeals to kids of all ages. My latest book is The Story of Fish & Snail, published by Viking last year. It’s about a Fish and Snail who live in a book together, and how their friendship is tested when Fish encourages Snail to explore another book. I hope The Story of Fish & Snail will encourage children to jump into new books, or even to write their own — perhaps new adventures for Fish and Snail! Henry: Well, you’re preaching to the choir. My young sons helped coauthor my books Nimpentoad and Monster Goose Nursery Rhymes (Pelican, 2015). Sometimes, when I’ve been working on a project for a long time, it can stop feeling fresh after a while — which can make it challenging to revise effectively. Henry: Agreed. I like to work on multiple manuscripts, so when I’m struggling with one, I can switch to another. Henry: The power of BIC! Connecting with readers through my books never stops being wonderful, even profoundly moving at times. Oh, I don’t know… I certainly don’t have this writing life all figured out! So how about this: never assume you have it all figured out. Henry: After multiple traditionally published books, it’s not figured out!? Yikes! Hopefully at all the usual places, but I especially encourage readers to shop at independent bookstores, and I try to keep my website updated with a list of stores that have signed copies. This article can also be read at Henry’s blog on KidLit, fantasy & science fiction. Categories: Books, Fantasy, Kids | Tags: author, fish, illustrator, interview, picture book, snail | Permalink.